RO systems use crossflow membrane filtration, where the water that is not purified exits the system as a concentrated brine. As water passes to the permeate side, the unpurified fraction of the water is left with all the salts, organics and colloidal particles that are rejected by the membrane. The higher the operating recovery, the more concentrated the brine will be. When dissolved salts in the brine exceed saturation, they begin to precipitate as scales. Likewise, organics and colloidal particles have a higher fouling potential as they become more concentrated along the length of the membrane system. AWC has developed highly effective inhibitors that eliminate the most challenging scales and significantly reduce colloidal and organic fouling in reverse osmosis (RO) and nanofiltration (NF) membrane systems. 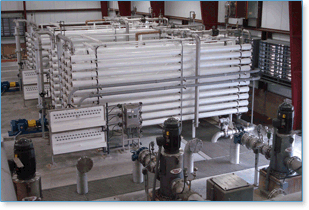 All AWC antiscalants are NSF approved for use in potable membrane systems. Our antiscalants are highly effective for all feedwater sources, including groundwater, wastewater, fresh surface water, seawater, and municipal water. Our high-performance reverse osmosis (RO) antiscalants are effective at remarkably low dosages and can inhibit scales even at very high saturations. The use of AWC antiscalants can eliminate the need for acid dosing, enable plants to operate at higher recoveries, and reduce cleaning frequencies. AWC RO antiscalants control scales such as calcium carbonate, calcium phosphate, calcium sulfate, barium sulfate, strontium sulfate, calcium fluoride, iron hydroxide, iron phosphate, silica, and colloidal foulants. Our RO antifoulants disperse colloidal silica and natural organic matter.